Brad Christian here, founder of Ellusionist. · The thing works like clockwork. It has to go on record as one of the easiest products to get a big reaction with. What you see in the trailer is real……people’s mouths fly open. They react, and then they want to HOLD the card and LOOK at it. Exactly what you want. Can I paint a simple picture for you? One way I’d use it? You’re out at dinner with a bunch of friends and it comes time to split the bill. Everybody is digging in their wallet. You dig, but hold back a bit. They look at you for yours. You pull out a hundred dollar bill, instantly FLAMING, and throw it onto the table. “Take it out of that”. How much FUN can you have with this wallet!! That’s really all I have to say. It’s a VERY simple product. One that probably everybody should own. The business cards you already have will work perfectly, as will any bill or playing card. The concept has been off the market for almost 10 years. Dirt cheap, crappy versions do exist, but the market has needed a high quality, turbo version of the wallet for a LONG time. Adam Wilber has done a spectacular job modifying and improving this wallet for workers. Here it is, enjoy. For reasons that are probably pretty obvious to those in the know, I’m not going to mention the person’s name on this page. But rest assured the person is credited in the video instructions as part of the history in creating this apparatus. Also rest assured, Ellusionist has upgraded, streamlined, high-technologied, and qualitied-up the product to the Nth degree. That’s why I put Adam Wilber on it, it’s what he does as product developer. The person in question is credited fully in the instructions, but I will not put them onto the actual product page given the circumstances. 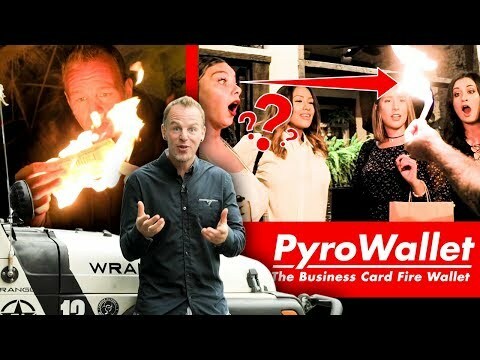 DISCLAIMER: Please be aware that Pyro Wallet does not ship with the lighter fluid required to ignite the contents that you put into it. Due to local laws and worldwide shipping policies, it is not possible. However, it is widely available in MANY stores that sell Cigarettes and even available on Amazon if you don't already have some.